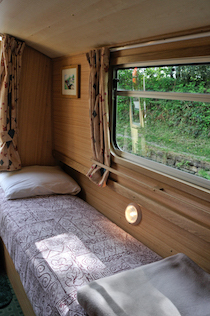 The Red Swallow class canal boat is rated 4 Stars and can sleep up to 8 people. DESIGN: The Red Swallow is a 56ft long, 8 berth cruiser stern narrowboat. It has a quiet water-cooled diesel engine with simple to use controls. BATHROOM: The bathroom has a wash hand basin, electrically operated flush toilet and shower, with toilet and wash hand basin in a separate cubicle, and a 240v shaver socket.